In 2010, David Stauble and Maria Ringo saw a need to offer the caring pet owner a convenient, wholly natural, pure food alternative to labor-intensive raw meat and home-cooked diets. While we still believe that raw feeding is ideal, we understand that sometimes there just isn’t time. Combining our many years of experience in the field, we developed an easy-feed recipe without compromising quality and Carna4 was born. We named our company after the goddess Carna. The ancient Romans believed she protected their internal organs –the heart, lungs and liver, helping their bodies derive nourishment from food and convert it to health and strength. That’s exactly what we want Carna4 products to do for your pets. Our aim is to deliver real nutrition with only true food ingredients and absolutely minimal processing. Our passion for natural foods first came from Maria, who is also a practitioner of complementary medicine and has the critical eye for all things healthy. 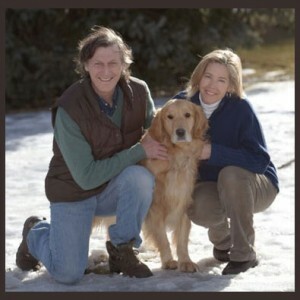 She blazed the natural foods trail in 1986, in Ann Arbor Michigan, where she and a friend co-founded Sojourner Farms Natural Pet Products, one of North America’s first raw-diet dog and cat food brands. Dave spent 22 years in charge of creating pet foods for Canada’s largest pet specialty retailer, producing one of the country’s best-selling holistic dog and cat food lines in the early 2000s. This experience opened his eyes to the shortcomings in commercial pet foods currently available. Together, Dave and Maria combined their experience to make the first 100% natural and nutritious true-food diet for dogs. Our 100% real food recipes contain no synthetics of any kind, not even the vitamin pre-mixes found in most other ‘natural’ foods. We offer your companion animal innovative ingredients that are amazing super-foods—-check out the nutritional power of our organic sprouted seeds! Made in Canada, we test every batch for safety before it goes to market. We are proud to work with other family operations who also believe in sustainability, a drug-free food chain, and non-GMO, humane farming practices. Thank you so much for trying our family’s Carna4 product line. Let us know how you like it. Maria & Dave brought their extensive experience in natural pet foods and joined forces to create Carna4 with a team of nutritionists, engineers and food scientists, who have graduate degrees in biochemistry, nutrition and biology. Our team has more than 50 years combined industry experience in developing complete and balanced pet foods. We enlisted the services of Mortec Scientific Inc., a third-party research and laboratory testing firm that specializes in food, pet food and natural health products for some of the most well-known consumer goods companies. Mortec also works with North America’s leading scientist in the field of identifying, classifying and transferring probiotics (or “good bacteria”). What happened next surprised all of us. The team surpassed expectations by formulating the first food to use only natural, pure food ingredients to greatly exceed AAFCO standards for the vitamins, minerals and other nutrients dogs need for all life stages and provide outstanding levels of antioxidants, live probiotics and enzymes. This success means that unlike other pet foods, we don’t need to add any synthetic or manmade additives. That means no vitamin and mineral pre-mixes, no preservatives, and 100% true food ingredients. How can this be? Essentially, Carna4 delivers pure, naturally boosted nutrition thanks to its recipe of sprouted seeds, table-grade meat, whole produce and herbs, which are gently dried to seal in the most bio-available nutrients and flavor possible. We then blend these whole food ingredients to preserve nature’s optimal balance of nutrients; quick-bake then air-dry our product in small batches; and then thoroughly safety test before it leaves the plant. Finally, Carna4 moves swiftly from our family-run bakery to your local pet specialty store’s shelf so that your pet can enjoy the freshest and tastiest food possible. The Carna4 difference means that you’ll likely see a change in the health and vitality of your dog. Unlike any other product on the market, Carna4’s fresh ingredients with bio-available, boosted vitamins & minerals, probiotics & prebiotics, antioxidants and Omega-3 fatty acids, have the power to give your dog a shiny new coat, brighter eyes and a new spring in his (or her) step.